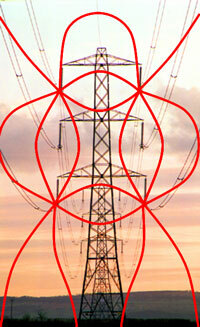 These pictures show the field lines produced by typical transmission lines. The field lines are calculated for the instant in time when the current and voltage on the middle phase is zero. Magnetic field lines circle round the current producing them. This calculation is for a line with transposed phasing so the magnetic field lines have a quadrupole pattern with four “poles”. If the line had untransposed phasing there would only be two. more detail on phasing. Magnetic fields are (basically) unaffected by the ground. For practical purposes they are affected only by magnetic materials such as iron and by thick pieces of other metal. That is why screening magnetic fields is difficult if you need to. But the ground can have a subtle effect on the magnetic field at very large distances from a power line (where it is probably too small to matter anyway) - more on these effects at large distances. 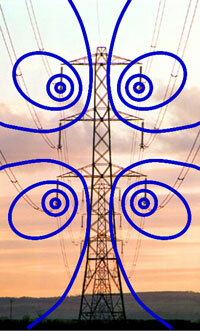 Electric fields radiate out from the voltage producing them. Electric fields from a line with transposed phasing also have a four-lobe shape. But electric fields are strongly perturbed by the ground and the electric field lines always meet the ground at right angles. That makes the patten more complicated. More detail on the different parts of a transmission line.